Paul Cezanne is one of the greatest French artists of all time. Paul Cezanne's work continues to display a mastery of design, color, tone and composition. His sensitive, compassionate and exploratory brushstrokes are highly characteristic and clearly recognizable. Cezanne's Still Life with Fruit Bowl is one of the most appreciated works of his entire collection ever painted. 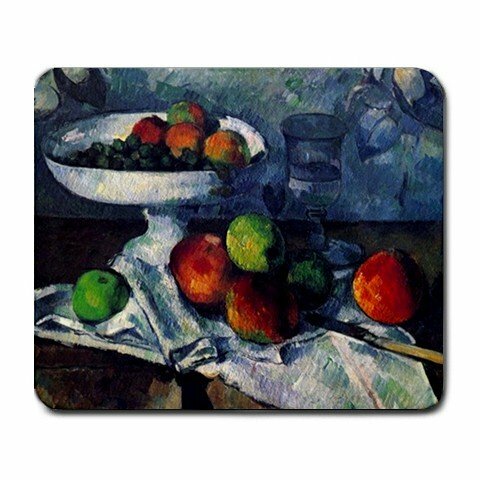 You can now own Paul Cezanne's Still Life with Fruit Bowl on this mouse pad! The mouse pad that displays the painting of Still Life with Fruit Bowl measures at 9.5 x 8 inches and is machine washable.